Mahindra has taken a shot at providing a seven-seat MPV to Indian families in the past. But the Xylo didn’t quite connect with car buyers quite like Maruti Suzuki’s city-friendly Ertiga at one end and the full-size highway specialist, the Toyota Innova Crysta, on the other. But as more Indian families decide to travel together, Mahindra went back to the drawing board to create an MPV that brings the best of both worlds into one package. A steep challenge only means a better vehicle for you and I, doesn’t it? On paper, the Marazzo promises quite a lot: the practicality of seven seats, the feel-good factor of a big vehicle and the frugality of a potent diesel engine. We take a quick spin around Mahindra’s Chakan facility to see what it’s made up of. What might take a bit of getting used to is the design. Don’t get us wrong, it isn’t even remotely as overstyled as other vehicles that wear the Mahindra badge. It walks the fine line between MPV and SUV quite well, tilting ever so slightly towards the latter. From the front, the snout looks familiar thanks to the toothy grille that’s dunked in black chrome. Mahindra has also cleverly split the bumper into two sections to make it look less bulky. The fog lamp enclosure is XL-sized and the eyebrow-like daytime running lamp setup grabs attention too. Rounding things off are the smoked projector headlamps that get thoughtful chrome detailing of its own. There’s some more of it on the side underlining the massive glasshouse and another small garnish on the door handles. Viewed from the side, the first bit that pops out are those 17-inch alloy wheels wrapped in 215-section rubber. This is also where you can see the design inspiration a bit more clearly; it does have that natural curvature of a shark’s head. This is partly due to the blacked out D-pillar that creates the impression of a floating roof, while also suggesting a shark’s fin lurking about. Mahindra’s designers have been thoughtful at the rear too, managing to break the visual bulk by ‘connecting’ the massive chrome strip to the indicators/reverse lamps in the tail lamp as well as splitting the rear bumper into two distinct sections. The exhaust tips have been neatly hidden away from view. Under that sloping bonnet lies a transversely mounted 1.5-litre, 4-cylinder engine that sends power to the front wheels. Now this alone would make you think that the Marazzo is based on a monocoque construction. We did too, and that’s where we were mistaken. The seven-seater is, in fact, a body on frame. This raises a lot of questions, doesn’t it? Let’s begin with the most obvious one: WHY? Mahindra says Indian conditions are ruthless, and drivers, even more so. They believe the ladder-frame construction will stand up better to the abuse our roads will dish out. Also, this means that the big Mahindra is lugging around a lot of weight. The engineers have tried to offset this by saving some in other places. For example, the oil sump is made entirely out of aluminium. Then, there’s the plastic cam cover, intake manifold, and oil filter that also saves some weight. Mahindra has really gone to town trying to shed those extra kilos. Take the front suspension for example - the knuckle, ball joint and the lower arm are made out of forged aluminium in a bid to reduce unsprung mass. These are components we expect on cars with go-fast badges, not a Mahindra. And, here’s the second question: which one? The platform is unique to the Marazzo, at least for now. 52 per cent of it is made from high-tensile steel, which makes it (in their own words) among the safest Mahindra vehicles ever to hit the road. The engine powering the Marazzo has been developed from the ground up by Mahindra. The 4-cylinder motor makes 123PS of power and 300Nm of torque. That’s impressive for a 1.5-litre motor with a single turbo, isn’t it? What’s equally impressive, is the way the Marazzo puts this power down. If you manage to not stall it, that is. From idle, in first (or even reverse), the MPV is quite easy to stall. One needs to dial in the revs to make sure it starts off smoothly. Once you’re up and running, it does pull clean. Get the turbo is spooled up (at ~ 1750rpm) and there’s a mild spike in pulling power. This consistent flow of torque continues right up to 2500rpm, right about where you’d upshift. And that will bring you back into the meat of the torque zone yet again. This should make city driving a breeze, considering you’re never left wanting for more power nor left playing with the gear lever too often. Where you might feel the need for more punch is when you’re out on the highway with the family in tow. It does seem like it can handle a lazy triple digit cruise without a hiccup. But in case you need to get going in a hurry, overtake a slow-moving vehicle in front or get around a set of tight twists on the ghat, you might be forced to downshift. Thankfully, the 6-speed gearbox is quite nice to use. The gear action is light and doesn’t take much effort. In case you’re wondering: no, the gear lever doesn’t dance about like it does in most Mahindras. That’s because it employs a 21st century-approved cable-shift mechanism along with aluminium shift forks and a dampener at the base of the shift lever. See? Mahindra’s been listening to our rants. Mahindra will offer four disc brakes as standard equipment, which gets a thumbs up from us again. Even under hard braking, the Marazzo held its line and tracked straight. Sure, there’s a bit of dive at the front end, but it never made us feel nervous at any point. Should things go south, Mahindra is offering dual airbags and ABS with EBD as standard equipment. However, side and curtain airbags are not on offer even in the range-topping M8 variant. Now, we didn’t have enough time to drive the Marazzo to our heart’s content. In fact, all we got were a few laps around Mahindra’s own test track that’s a mix of long straights and a couple of banked corners. Around the bends, the Marazzo has a fair amount of body roll. Nothing that will upset occupants, irrespective of which row they’re seated in. Expectedly, the suspension has been tuned to be soft. So, once you hit a bump, you feel every bit of it, but the car takes a second to regain composure. While occupants in the first and second row are unlikely to complain about anything, the ones in the third row might feel some extra lateral movement over nasty bumps. That said, the whole cabin feels fairly composed at cruising speeds, but we need to test it on public roads before offering a final comment. Then there’s the steering that feels communicative enough. Even in terms of weight, it’s nearly spot on. Super light at parking speeds and heavy enough at even 140kmph (god bless private test tracks!). So that’s a job well done too, then. Mounting the engine transversely has not only helped Mahindra save weight but also free up some more room inside the cabin. As much as 150mm, claims Mahindra. Mahindra engineers say, when measured from the pedals to the third row, the Marazzo offers almost as much cabin length as the Innova. First impressions of the cabin are quite positive. The basics have been done right - you do not have to ‘climb’ into the car, the dash is set nice and low and the windows are extra large, letting in more light. The essentials of seating comfort have been tackled well too. We’re going to start off with a bold statement here — the seats feel more supportive and better cushioned than that of an Innova Crysta. The seats are wide with a generous amount of bolstering around the side to hold you in place. Hop into the second row and it’s more of the same. If you live in hotter parts of the country, you will appreciate the sunshade that cuts out quite a bit of heat and light. Rounding things off are the individual armrests for each occupant in the front two rows. While we sampled just the captain seat variant, we have no reason to doubt the Marazzo’s capability of seating three abreast in the second row. And that’s because we could WALK into the third row. For reference, yours truly is six foot tall and erm... generously proportioned. The other way of accessing the third row involves tumbling the left captain seat forward, which can be done with a single tug at the lever. Even in the last row, you’d appreciate the inclusion of adjustable headrests, which is standard across the range. Thumbs up. Kneeroom? Let’s just say it was enough for a six-footer like me to sit behind my own driving position in the second row, and also in the third row. That’s saying something, isn’t it? In the third row, the knees don’t point upwards too much. Even a full-grown adult wouldn’t have issues sitting here for short trips. With the Marazzo, you do sense Mahindra’s intent on pushing the envelope as far as usable features go. The roof-mounted ‘surround-cool’ air-conditioning for the second and third row is a great example. It isn’t a mere blower that grabs air from the front vents and shoots it out. It gets a separate evaporator coil and blower unit. The two modes - ‘Diffuse’ and ‘Direct’ are well thought of too. In the former, all vents blow a gentle breeze, whereas direct mode ensures a proper blast of cold wind on the occupants. There’s a coloured 4.2-inch TFT screen in the dash that reads out navigation instructions, tells you if your wheels aren’t pointing straight and also remembers your spouse’s birthday for you. The purple illumination might be a bit over the top for some, but that’s something we’re willing to make peace with. The 7.0-inch touchscreen, too, is snappy to use. What separates this unit from other Mahindras is the haptic feedback integrated for the on-screen ‘buttons’, making it just that bit easier to use on the move. You also get the option of Android Auto, while Apple CarPlay is in the works. Other apps in the suite include Mahindra’s ‘EcoSense’ that ranks your driving behaviour as well as emergency calling. What we didn’t quite like was the reverse cam. While it starts up quickly and also offers voice guidance for parallel and perpendicular parking, the video feed tends to lag a bit. In terms of design, the white ceramic-finished insert on the dash looks chic. But we have our doubts on how this will age over time. Ditto for the massive slab of piano black on the dashboard. It does look nice, especially with the detailing near the left AC vent, but it might just end up being a blackboard for the kids to scribble on. There’s more of the not-so-premium plastic to be found on the ORVM controls as well as the power window buttons. And in true Mahindra fashion, there are some weird snafus too. For instance, the yacht-inspired handbrake brushes against the driver’s seat every time you operate it. There’s no central locking button on the dash either — the driver has to pull the lock on his/her door to unlock the vehicle for someone else. Then there’s the fact that the 12V socket and the dual-USB sockets in the first row are placed way to low to access easily. And there’s a single USB socket at the rear for five/six occupants. That’s hardly fair, is it? A 12V socket would’ve been a lot more useful for the second row, coupled with at least one USB port for the third row. Since we’re talking about misses, it’s hard to not miss features such as keyless entry, push-button start/stop, telescopic adjust and a leather wrap for the steering wheel, especially when vehicles from a segment or two below offer these already. Mahindra has prepared well for this. The Marazzo comes in well before the festive season where we loosen our purse strings generously. This also gives it a near two-month lead over the brand new Maruti Ertiga that’s expected to debut by November. For us, the Marazzo is a sign of things to come. For Mahindra, it definitely is a step in the right direction. As a product, the MPV feels mature and grown-up. We like the fact that the basics are done right. It’s spacious, comfortable and easy to drive on a daily basis. Sure, there are a few misses on the equipment front, but it isn’t exactly scantily equipped either. Also, there are bits we’d reserve our final judgement on, like real-world fuel efficiency and how it performs on the highway with a full passenger load. 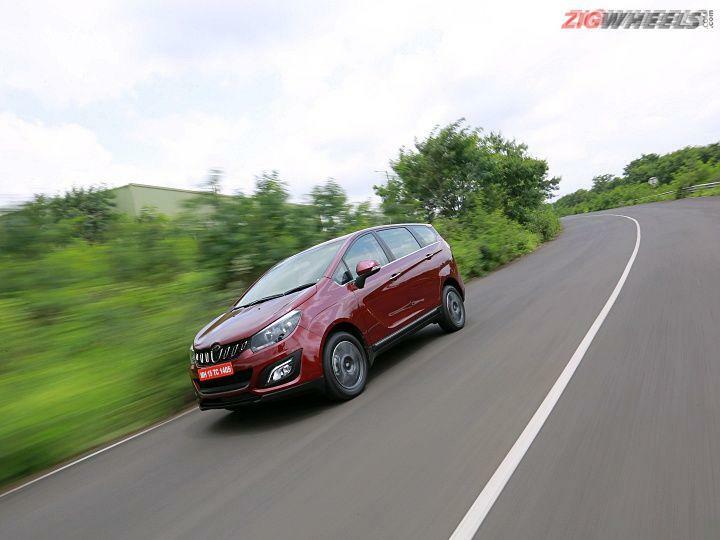 We’re ringing Mahindra as you read this to borrow the Marazzo for a longer period of time for a proper road test. With prices starting at Rs 9.99 lakh and topping out at Rs 13.90 lakh ex-showroom India, it’s closer to the Innova Crysta than the Ertiga. The real question then is how the Marazzo holds up in the long run. If Mahindra can calm our nerves over time on that front, the seven-seater does seem to be a strong contender, whether you’re looking at buying it for your family or your fleet. Love to drive awesome car!!! Love to drive awesome car!!! is there any automatic transmission available for M4 & M6 variant??? is there any automatic transmission available for M4 & M6 variant??? They should have increased the cubic capacity to at least 1.8 or 2.0 Liter for better riding comfort.The design looks like a combination of many MPV models in the market. They should have increased the cubic capacity to at least 1.8 or 2.0 Liter for better riding comfort.The design looks like a combination of many MPV models in the market. Mahindra needs to kick it's design team OUT and seek help from third party design consultants. This one looks horrible from all angles. Another Renault lodgy? Mahindra needs to kick it's design team OUT and seek help from third party design consultants. This one looks horrible from all angles. Another Renault lodgy? Share your experiences with Marazzo?